October Skiing in Lake Placid!!! Amazingly, we have a "Tip o' the Tuque" already to the great grooming staff at Mount Van Hoevenberg, site the 1980 Olympic Cross-country ski trails here in Lake Placid. 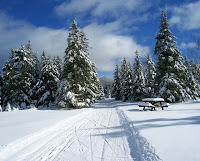 After ~ one foot of snow fell, the trails were rolled to early-season perfection. Everyone was treated to unusually excellent skiing, from the athletes in town staying at the United States Olympic Training Center to us local-yocal skiers just giddy with delight over this Halloween treat!